Nothing beats a summer road trip: the alarm goes off at 4:00am and you’re ready to hit the road. The darkness turns to grey as you finish packing up the car and load the cooler into the trunk—icy beverages for the ride up, and a six pack of a beer when you get there…and of course: the meat. Summer is the season of beaches, bikinis, and of course: barbecues. But while grilling in your backyard may be awesome, grilling on the road is even better. So we’ve rounded up our top 10 picks for the best tried-and-true charcoal portable (and some not-so-portable) grills. 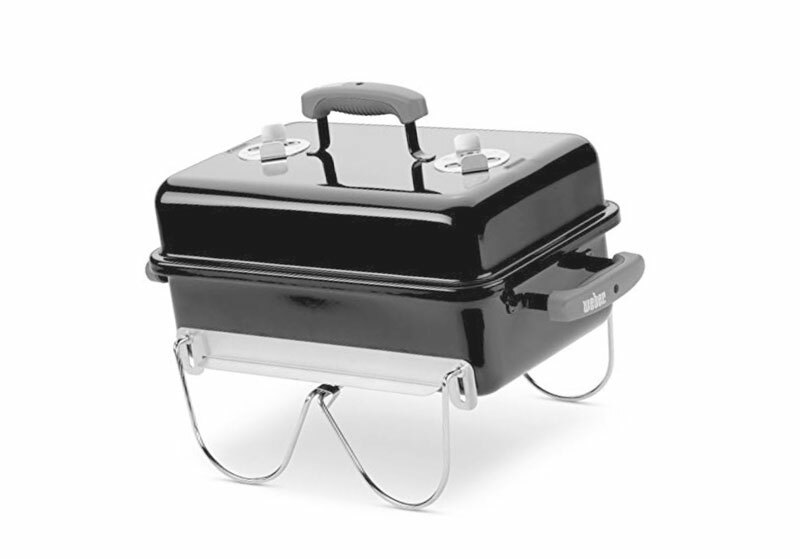 You can’t go wrong with the classic design of this kettle-syle portable charcoal grill. 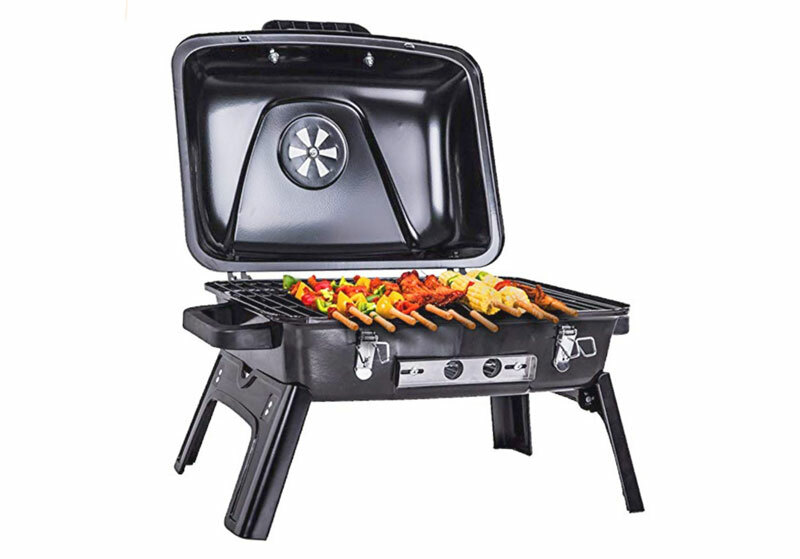 At an affordable price, this charcoal grill is great for the patio but small enough that you can haul it to the camp site. The 18” grill diameter will fit between 5 and 8 burgers at a time, or a couple of sizeable steaks. The tried-and-true design means it grills to perfection and works exactly like your dad’s old grill from the 1980’s. We came, we grilled, we conquered. It’s easy to clean and intuitive to assemble, which means you can take it apart and pack it up for the off-season to keep it shining. 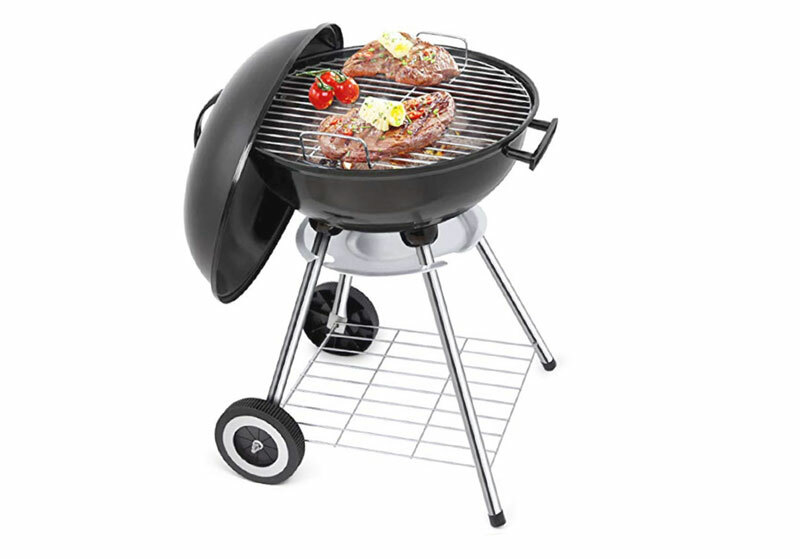 We especially love the price, which is a considerable bargain compared to other grills of this size. Similar to our number 10 pick, this Weber Portable Grill packs the classic kettle-design that we all love in a charcoal grill. It’s a no-frills-just-grills piece of equipment. And we love it. With a 14” diameter, though it has a considerably smaller cooking surface, but it’s also much more compact—which means she’s perfect for tailgating, camping, and all-purpose road tripping. Even though the size is a bit on the smaller side, we were still able to feed the hungry masses – and if you can’t fit everybody’s burger on in one round, just give ‘em another beer. This grill is priced competitively, and with a brand like Weber you know you’re getting quality. It’s highly portable…meaning it’s a bit small! The Akorn Jr. Kamado style ceramic charcoal grill is a great alternative if you don’t have the budget for a Green Egg. Even for the inept, assembly is straight-forward and takes about thirty minutes. We’ve found that the size of this particular grill fits enough meat for about 3 people (a few steaks and some chicken), and cooks them absolutely beautifully. As far as portable grills go, she’s a little bit on the heavy side – at 37 pounds – making her more than you might desire for your average camping trip. Although it wasn’t our experience, we’ve also seen reports that their grill was missing bolts upon delivery. So a heavy pot and shoddy shipping puts the Akorn Jr. Kamado Charcoal Portable Grill at number 8 on our list. If I could pack up a grill and take it with me to work every day, then the Weber Go-Anywhere would be it. No other charcoal grill will better remind you of those old family camping trips, or burgers on the Fourth of July than Weber’s Go-Anywhere portable. She’s price for the budget-oriented, light as a feather, and the legs fold up on top of the lid nicely to make it easy to carry anywhere: whether to a tailgating party or your office parking lot. The rectangular surface fits about 6 medium-sized burgers, and it requires no assembly. Just open the box and get cooking. However one common issue is that the base of the grill is shallow, meaning there’s not a lot of space between the charcoal and the griddle, so make sure you spread your charcoal accordingly. 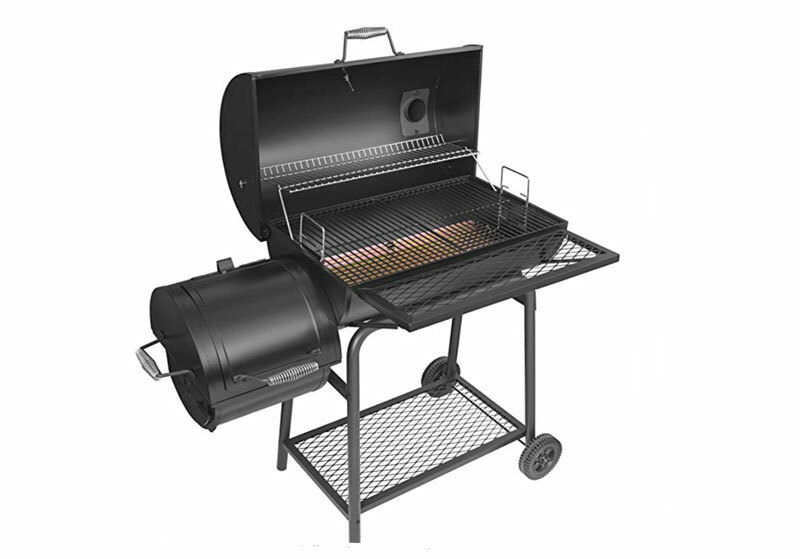 Overall a great, reliable charcoal grill for the money and we recommend it. The Cuisinart Portable Grill is a mixed bag. On the one hand, if you know what you’re doing, you’ll be able to grill daily, any meat you want, to perfection. On the other hand, if you don’t take the time to learn how to grill properly, you might find yourself a bit frustrated with this. The price is ultra-affordable, which makes this your grill-for-any-occasion. It’s a perfect back-up, or even your primary grill for a spur-of-the-moment weekend getaway. Just take the time to burn it off when you get it, and you’ll find that this is the best portable grill you can get for this price range. Okay, it’s not technically a “portable” charcoal grill, but we love the Royal Gourmet Grill enough that we had to put it in the list. (It does have wheels, though so that’s gotta count for something, doesn’t it?). 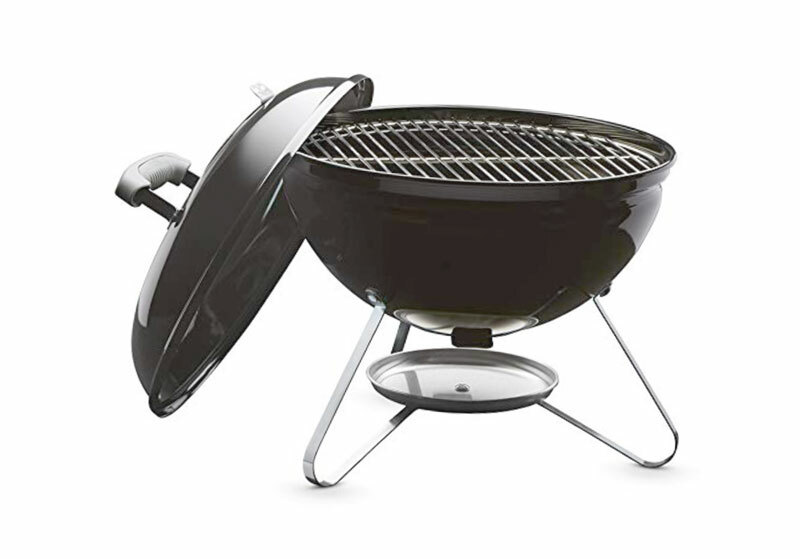 As with any patio-style grill, the Royal Gourmet is feature-packed, from top to bottom. Adjustable, easy-clean racks, side tray, thermometer, and a spacious lower shelf to name a few. 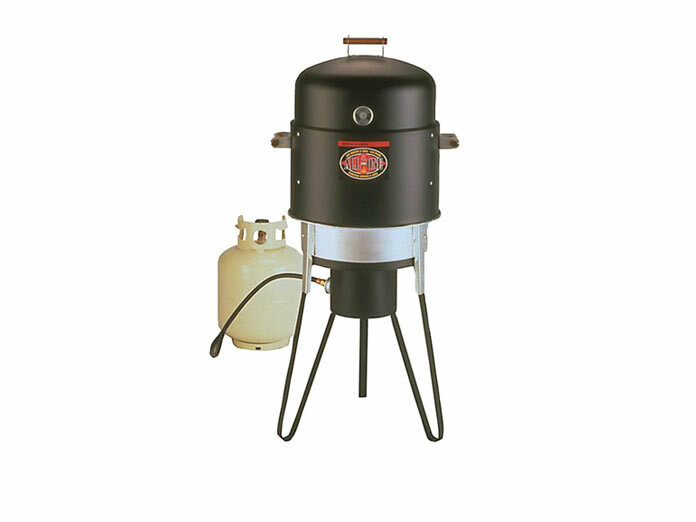 But where the Royal Gourmet sets itself apart from the rest is the offset smoker. 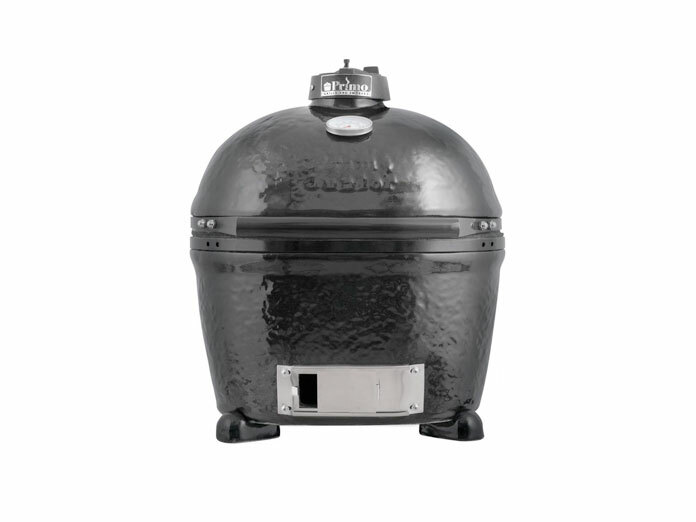 It will hold separate charcoal and let the smoke and heat flow into the main chamber so you can smoke to perfection—even if you’re a complete noob at learning how to smoke meats, then the Royal Gourmet charcoal grill will help get you started. We were so impressed with the smoker that we had to put the RG CC1830F Charcoal Grill at number 5 on our list. The Akorn sits at number 4 on our list purely because of the quality of cooking that it’s capable of. 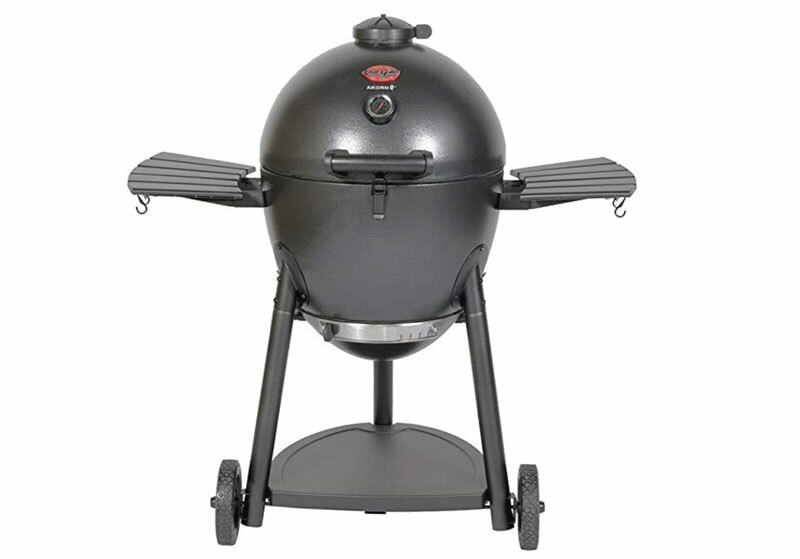 This charcoal grill in Kamado style has enough space to rotisserie a whole chicken, cook the whole family’s steaks to perfection, and be a burger and hot-dog conveyer for a small army. The size, though not by any means considered “portable”, is enough for a family of six, and you’ll find it to be welcome at all of your summer parties. The only downside though is the price, which you might find to be a little bit of a budget-breaker. For what it’s worth we really like the Akorn. 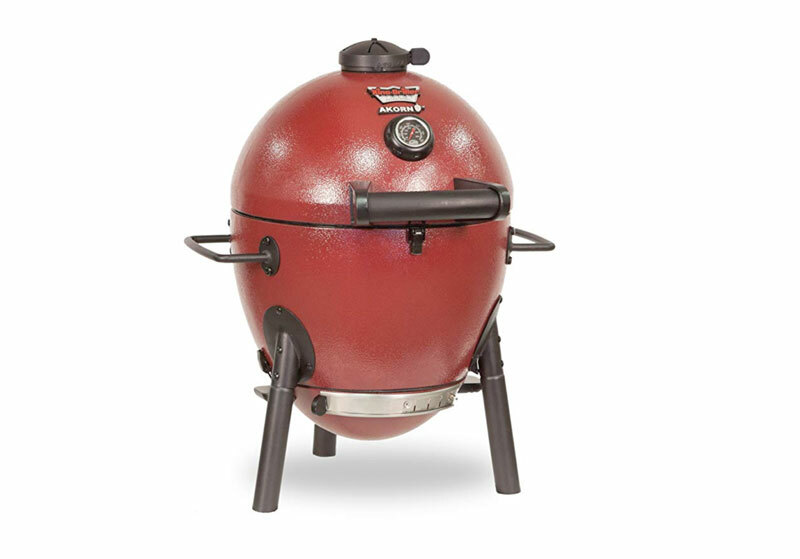 We understand that not everyone has the budget for a Green Egg, but as far as ceramic grills go, this one grills a mighty fine steak and some very hearty hamburgers. If you’re looking for a stationary ceramic grill, then you should definitely give the Akorn a shot. 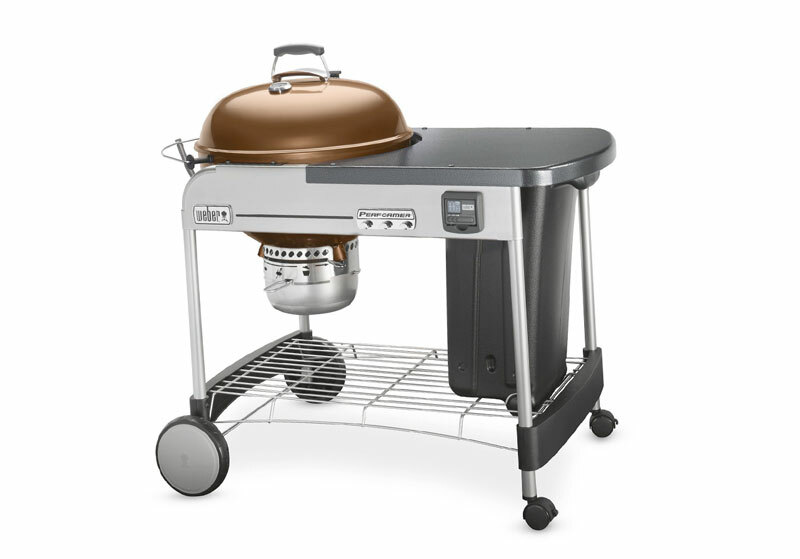 Weber does it again with their Performer Premium model. This charcoal grill is big enough to grill in comfort, but the four-wheel design makes it more than mobile. You can even hitch it up and pull it behind your station wagon (kidding). If you thrive on organization, then this is the grill for you: 22” grilling surface, an enormous prep area, tuck-away lid storage, easy one-step cleaning (with removable ash-pan), extra charcoal storage, and tool hooks. I’m especially thrilled with the ample space for both prep and cooking – which means I don’t have to scavenge for a place on the picnic table to put the raw meat, or keep the tools I’m not using. The grilling experience becomes much more enjoyable and relaxed when you know you have plenty of open space to work on without interfering with the picnic table. The pressure of “gotta feed everybody NOW” kind of just melts away when you’ve got a nice open workspace. This is really a beautifully designed grill with a specific place for everything you need. It makes grilling not just easy, but allows you to relax and enjoy yourself more when you’re not fighting with your nephew to make room at the table for a spatula and grill-lid. Fair warning, though: this grill comes with a little bit of sticker shock, but we’re convinced that it’s worth every juicy penny. The Pinty 250 is true to its name: a pint-sized, charcoal portable grill featuring 250 square inches of grilling joy. It’s perfect for portable charcoal grill for tailgating parties, camping, barbecues, and road trips. The thing that impresses us the most about this little beauty is the shear amount of meat that you can fit on the grilling surface. We were able to fit six brats, two steaks, and four burgers…all at the same time! Each one came out beautifully cooked, succulent and juicy. 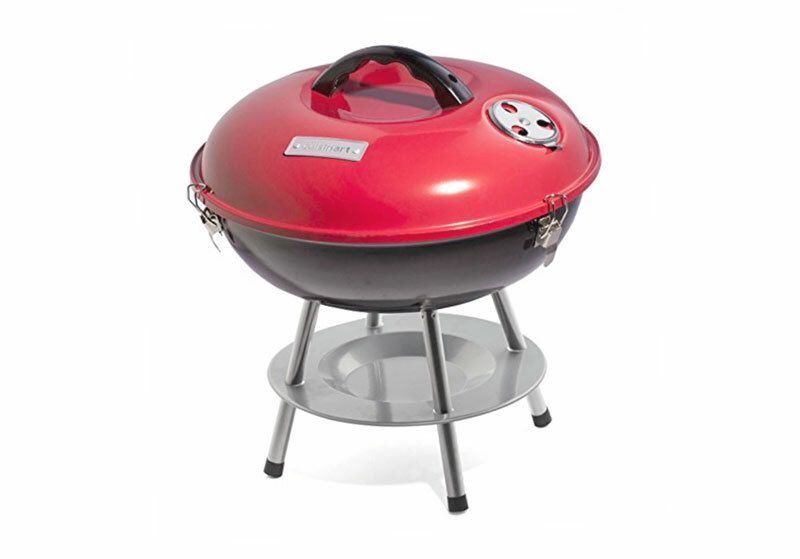 The Pinty 250 is an efficient portable grill and beautifully priced. A full wallet means you can buy more meat, and more meat means a fuller stomach. Does it get much better? We submit that it does not! The only downside to this charcoal grill is that you might easily overload the little guy. We’ve found that the legs can be a little bit flimsy, so you may not want to load it up with as much steak as you can fit on it. Just pace yourself and enjoy the experience. When it comes to grilling, it’s both the journey AND the destination that count. Either way, she’s a fantastic little grill, priced for a good budget, and so truly portable that you can take her pretty much anywhere. An expression of a classic, and we’re not getting rid of this one…ever. 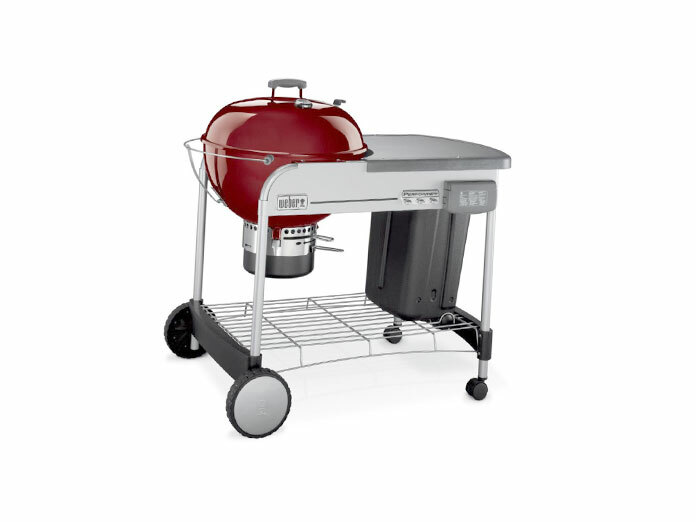 Last but certainly not least, our number one choice for the top ten Portable Charcoal Grills is the Grillerette Pro. This charred beauty takes number one on our list because of its unique feature set and ultra-portability. 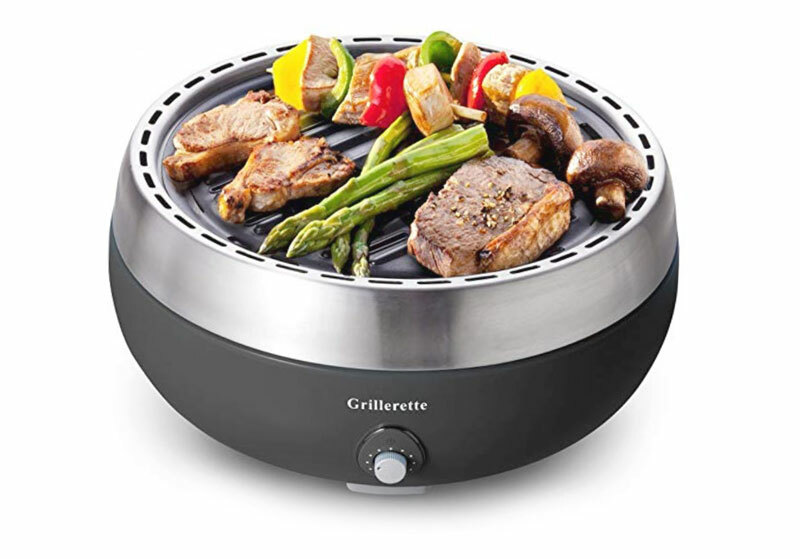 The grillerette uses an efficient “scientific” construction to maximize the heat flow from a smaller number of coals, isolating the coals into an individual cylinder under the grill and then spreading the heat evenly using a battery-operated fan from the under carriage of the grill. The result? Beautifully grilled burgers, dogs, steaks, ribs, chicken, veggies, and everything in between. Lightly seared on the outside, juicy on the inside. We put the Grillerette as our “Numero Uno” because of the ingenious blend of cutting edge technology with classic charcoal grillery, an excellent price-point, and the truly portable nature of this little grill. Take it anywhere, cook anything. The summer of 2019 is turning up a lot of grilling options – both backyard beauties and parking lot portables – there’s something here for every occasion. Whether it’s your kid’s birthday party, the Fourth of July, or a mid-summer road trip – and regardless of whether your budget is scraping the bottom of overflowing, there’s something for every occasion, every budget, and every flavor! There are a few main factors you definitely don’t want to take for granted when purchasing your grill: price, effectiveness, ease of use, ease of assembly, and longevity of the machine. Understand that for each of these characteristics, you’ll have to trade. The best grills aren’t cheap, and the cheapest grills may not last a lifetime. In any case, the best way to get the grill that’s right for you is to understand your priorities. These have been our picks for the top ten Charcoal Portable Grills for 2019. We’ve shared our favorites, now tell us yours! Which grill do you plan to use to celebrate the Barbecue Season?